My company, Virima Technologies is seeking an experienced Senior Systems Engineer for opportunity with a client in Atlanta, GA. DESCRIPTION: Senior Unix Systems Engineer with experience working in datacenters and hosting facilities. “Hands on” experience with Solaris and/or RedHat is required. 10+ years of UNIX systems experience in a large, 24×7 environment. Must have experience in a highly-available UNIX environment. Experience and deep knowledge of Solaris 9 and 10. Experience and deep knowledge of RHEL 4.x and 5.x in a virtualized environment. Sun Blade Center hardware experience required; other high end server experience a plus. Advanced experience with Veritas Volume Manager (VVM) and Veritas Cluster Server (VCS) or equivalent. Experience with BIND, Sendmail, and Apache servers. Strong knowledge of infrastructure services: LDAP, DNS, NTP, NFS, and DHCP. Knowledge of multi-tiered application architecture. Ability to compile Linux kernels and driver modules. Strong knowledge of RHEL Kickstart procedures. Strong scripting skills: Korn, Perl, Bash, AWK, Sed. Python skills a plus. Ability to document project designs, process, and policies. RHCT and RHCE certification a plus. Problem solving brings you great joy. Bachelor’s degree or equivalent education in related fields. 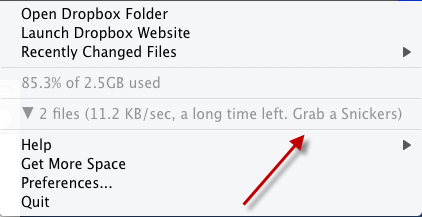 My Dropbox has a sense of humor. The new Star Wars EP3 trailer is out tonite. Until the real deal, a bootleg is available here.